Release Day for Tempting Mr. Jordan! Today is release day (happy dance!) for Tempting Mr. Jordan, an historical romance set primarily in Maine in 1871. The heroine in this book is Julia Tenwick, who we last saw in Stirring Up the Viscount as the hero’s precocious little sister. Now she’s all grown up, and heads off to America for one last adventure before settling in to life as a spinster and doting aunt to her brother’s children. One of my favorite scenes in the book comes from a sketch I saw at the Cleveland Museum of Art a couple of years ago. It was in an exhibition called “Maine Sublime,” which featured landscapes by Church and other members of the Hudson River School. In it, there was a sketch he used to paint one of his more famous paintings, Twilight in the Wilderness. Julia pulled her cloak around her shoulders and left by the kitchen door. Soft snowflakes danced lightly around her head as she made her way toward the water. She loved the crisp air, the snow, the scents of wood smoke, salty waves, and pine. She walked around toward the lighthouse, imagining how much her brother would love it here. He’d have his sketchbook tucked under his arm, ready to pull out at a moment’s notice when the mood struck. The snow began to fall faster, swirling around as she clambered over the large rocks at the water’s edge. The sky was streaked with red, orange, blue, and gray, and she stopped, perched, just to watch. She jumped at the strident tone, nearly toppling into the water. Regaining her balance, she turned carefully, and sighed. Geoffrey Jordan sat on a neighboring rock behind her, sketchbook in hand. His expression was darker than the sky had been when she started on this walk. Julia was unable to stop herself from stepping back in surprise. Apparently there were bears near the shore as well. “You’re blocking my view.” The muscles of the man’s face settled into a grimace which Julia found only marginally less frightening than his scowl. “All right, I’m sorry! I didn’t see you there.” Julia took another step back and cried out in pain as her foot slipped into a crevice between the rocks. Geoffrey swore and tossed his sketchbook to the side. He strode over to her and held out a hand. Given his expression, Julia considered whether it might be safer to remain where she was. Geoffrey stuck his hand out again, waving it impatiently. “Oh, for God’s sake!” He reached down with both hands and grabbed her waist, pulling her to her feet. She ignored the tingling of her skin where he touched her and focused on her anger instead. He returned to his sketchbook and sat down again. He started scribbling, ignoring her. She ignored him as well and gingerly ran a hand over her throbbing ankle. Her stocking was torn, and a shallow cut showed through it. Deciding she should return home to clean the wound, thanks to this odious man, she slowly made her way across the rocks past him. She caught a glimpse of his sketch as she passed. Intrigued, she stopped and bent at the waist, looked over his shoulder. “Your handwriting is terrible. What does that say?” She pointed again. He laughed, and she turned her head to look at him. He was much less frightening when he laughed. Handsome. She blinked and unbent. “I don’t disagree.” He stroked his pencil across the paper a few more times, and she craned her neck to look. Julia turned to look at the sky. It was gray now, with little wisps of blue and white streaked across it. All of the stunning red and orange hues were gone. She suddenly felt terrible for ruining his view. “Fine! I’m sorry I yelled at you. Now go home, before you truly hurt yourself.” Before she could reply, he tucked his sketchbook under his arm, stood, and scrambled away across the rocks like a crab. She watched him go, annoyed with him and herself in equal measure. Well, mostly with him. Insufferable man. She gingerly followed, lifting her skirts higher to avoid the rising water. The tide was indeed coming in. She hated that he was right. You can read more about Tempting Mr. Jordan–including buy links, should you be so inspired–at my website. And should you find yourself in northeast Ohio, you can see the original of Twilight in the Wilderness, which hangs in Gallery 206 at the Cleveland Museum of Art. Perhaps it will inspire you too. 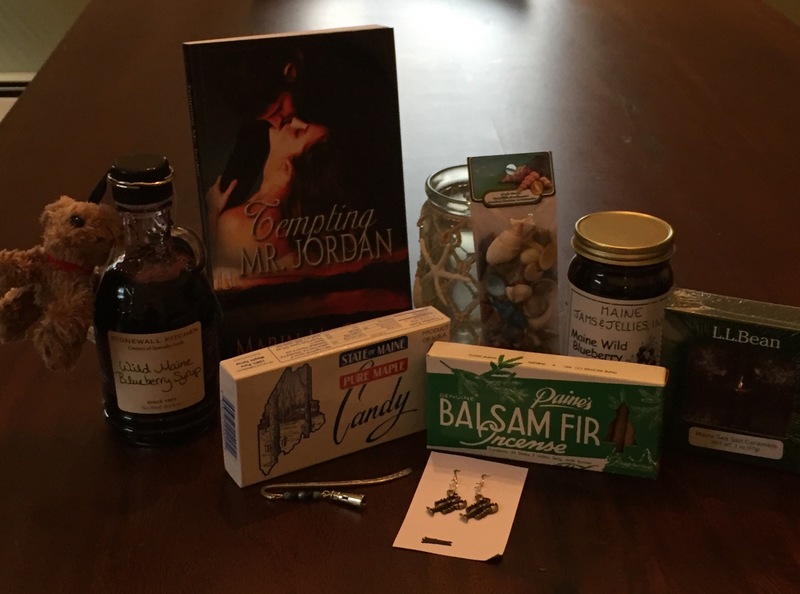 And if you follow me on Facebook, Twitter, or Goodreads, you can enter to win this great Maine-themed gift box, offered by me and author Becky Lower. It’s Autumn again here in Northeast Ohio. I adore Autumn. I love the crispness of the air, the smell of burning leaves (it’s illegal to burn leaves here, so I always wonder where that smell comes from…), fresh apple cider, pumpkin pie, hot soups and stews, warm, cozy sweaters. I love the crunch of newly fallen leaves underfoot, the rich color of the trees, and the dark, dark blue of the sky on a stormy day. It’s the season of my birthday, Halloween, the Annual NEORWA retreat, and my favorite holiday, Thanksgiving. I tend not to focus on the fact that fall means winter is coming. Winters are pretty harsh here–last year was really a doozy–but living in Cleveland teaches one to live in the moment, at least as far as the weather is concerned. So I enjoy the awesomeness that is Autumn, and worry about winter later. This year I have more reasons than usual to look forward to Autumn. 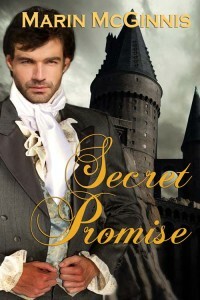 In addition to my 50th birthday, this October brings the release of my second book, Secret Promise. I started to write it in during NaNoWriMo in November 2013, finished it in November 2014, and it takes place largely in the fall, so I had many of the things I love about the season in mind as I wrote. Falsely imprisoned as a blockade-runner during the American Civil War, Edward Mason yearns to go home. But when after seven years he finally returns to England, the life he expected is gone. His parents are dead, his home destroyed, his father’s legacy stolen, and his girl—his girl is now the single mother of a child Edward never knew. Abandoned by the man she loved and disowned by her family, Anna Templeton has learned to stand on her own two feet and make a home for her son. Now the successful owner of The Silver Gull tavern, she’s not about to put their happiness in the hands of the one man who let her down so badly. Edward is determined to regain Anna’s love and be a father to his son. But when a series of suspicious accidents threaten him and those he loves, he must stop the man responsible, or lose everything. Available in ebook and trade paperback from The Wild Rose Press and Amazon. Also available for Nook and Kobo. She meandered back to the bar through the now empty room, scooting chairs under tables, watching Edward, who now sat slumped over his untouched drink. Lightly squeezing his shoulder, she leaned against the bar at his side. “A different man, maybe. Not you.” She thought for a minute as she gazed at him. He was older, certainly; they both were. He was harder, more…careworn, she supposed, although the scar added an air of devilishness she had to admit was really quite appealing. She reached out and traced the mark with her index finger before she could stop herself, feeling the warm flush of his skin. Edward barely stirred, just eyed her from beneath his impossibly long, dark lashes. “No. And you aren’t the same woman, I imagine.” He grabbed her hand to keep it still. She could feel the beat of his heart racing through her fingertips. Hers was not far behind. Edward rose from his stool, tossed a coin onto the bar. “No, I didn’t.” In a single movement, he pulled her to him, pressing his lips to hers. She closed her eyes, tasting. He was the same as he had been on the cliff top, or at least the way she remembered him. Salty, sweet, the slightest bit sour from his last drink, all mixed together with something that was uniquely Edward. She wanted to crawl inside him, become part of him again, just as she had seven years before. She moaned, grasping him tighter, even as he pulled away. Her eyelids fluttered as her brain tried to understand the absence of him. He rubbed a finger along her bottom lip, his gaze burning through hers. “Not yet, Anna. You aren’t ready to take me back. But you will.” He kissed her again, hard, then was gone. Her legs were jelly as she slumped against the bar.